International superstar Whitney Houston was finally laid to rest last weekend in a simple New Jersey funeral, where she was sent off by some 1,500 mourners, family and celebrity friends. The four hour service was described by family members as a celebration of Whitney’s ‘return home’, but few could hold back their tears as friends and family reminisced over the star’s short but star studded life. Among the mourners in attendance of the funeral, were stars such as Mariah Carey, Jennifer Hudson, Chaka Khan, Alicia Keys, Stevie Wonder and Oprah Winfrey. Furthermore, during the service the well-known actor Kevin Costner paid tribute to the ‘Dance With Somebody’ star, who he described as his friend. Whilst giving what can only be described as an emotion-fuelled speech, Costner urged the world to ‘dry our tears, suspend our sorrow and perhaps our anger’. 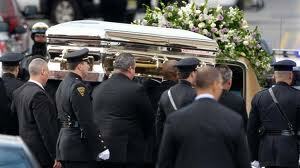 Also in attendance at the funeral was Whitney’s ex-husband Bobby Brown, who split from the singer back in 2007. The two were known for having an extremely volatile relationship and many people have even blamed Bobby for introducing a life of drugs and excess to Whitney, who famously battled an addiction to both drugs and drink. However, in the months leading up to her death it had been reported that Whitney was slowly overcoming her demons. Whitney was found dead in the bathroom of her hotel room, the night before the Grammys. The exact cause of her death is still yet to be determined. This entry was posted on Sunday, February 19th, 2012 at 5:07 pm	and is filed under Music News. You can follow any responses to this entry through the RSS 2.0 feed. Both comments and pings are currently closed.